Climate Progress points us to some good news today. The latest Brookings poll on climate change shows that belief in global warming has continued to rebound from its recent lows. Acceptance of climate change still isn’t as high as its post-Inconvenient Truth peak, but at least progress is being made. Broken down by party affiliation, both Democrats and Independents are stronger believers than in 2010, while Republicans remain mired at the same low levels as always. But the rest of the news isn’t so good. It would be nice to think that people are being swayed by the increasing torrent of scientific evidence about climate change, but it ain’t so. 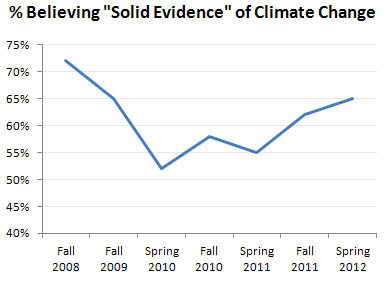 As the table below shows, only 11% of respondents say that scientific research is the main reason for belief in climate change. The most popular reason by far is personal observations of weather and warmer temperatures. And in a followup question, 68% of respondents said recent mild winters have had a large effect on their views. Conclusion: liberals need to stop nattering on about the latest research. It may gall us to do it, but anecdotal evidence (mild winters, big hurricanes, wildfires, etc.) is probably our best bet. We should milk it for everything it’s worth.